for my dining room chairs to be exact, and I mentioned a few weeks ago I had made a decision once I saw these slips made up at my friend Debra's store, Inspirational Home. There is a lot of inspiration out here, and I just found these beauties on Pinterest. I even tried my hand at making some a couple of years ago, but they didn't satisfy my need for something soft, linen-y and beautiful. So...I've been waiting to find the right ones. The alternative was to paint my Dining Room furniture, and I just never really wanted to do it. If I could wave a magic wand and have it done...then OK. But I never could "get there" if you know what I mean. Soon these babies will be wearing new little custom made dresses! I can't wait either to see the new dresses. Love the linen look so soft and elegant. You chose beautiful inspiration to share with us. Love all of the whites. Have a wonderful weekend. Can't wait to see these slip covers.They are going to look great on your chairs.Your dining room set is beautiful. You've picked the perfect fabric! How lucky to find a great seamstress too! I like the short skirt version... I have fabric, but who knows when I'll get around to making them...if ever. I can't wait to see yours! I can't wait to see how they turn out, Debra! Oh I know they will be beautiful! Looking forward to seeing the finished product! Debra I've been thinking of doing the same with my dining room chairs. Can't wait to see yours, they are going to look fabulous! how fun to design your own slips--can't wait to see them! i can't wait to see them! I have plans (too many) to make some washable seat covers with a little skirt. But now that I've seen all those great Pinterest photos, I want several sets! One of these days I WILL buy a sewing machine and teach myslef to sew... and slips will be my first project. One of these days, yes....one of these days. They are sure to add brightness! Can't wait for you to share you *makeover* chairs! Hi Debra, I know they will look beautiful in your dining room.Can't wait to see them. i think your chairs are going to look great...and eventually "all white" will go out of style and your stained chairs will be in vogue again, right? i have some white slipcovers from "target" that i use on my kitchen chairs occasionally, that is, until i change things around, AGAIN. can't wait to see your new looking chairs! I'm so looking forward to seeing your slips...you have such good taste! They are a great alternative to painting the chairs! I can't wait to see those gorgeous slip-covers! Can't wait, Can't WAIT!!!!! Have a blessed weekend, HUGS! I know they will be wonderful. Can't wait to see them in your room! Hi Debra, I have been following you for a few months now here and on Pinterest. You have quickly become a favorite. Would you mind answering a few questions about what you do for me for an upcoming feature blog post? Thanks! 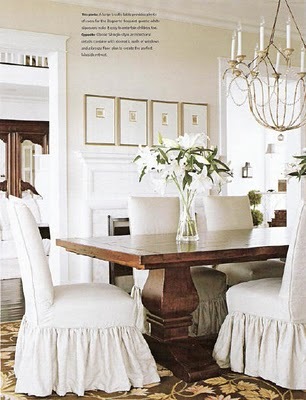 I love slipcovers! I know yours will look great on your chair. I can't wait to see them. That is exciting! I love slips on chairs, too. It makes them look like little ballerinas all dressed for the ball. It's going to be just gorgeous! OH Debra, the covers will be beautiful! Your dining room will be transformed! Can't wait to see it!